The above Royal Mail Wembley Stadium: Miniature Sheet stamps were issued on 17 May 2007 by Royal Mail and feature the following stamp designs: 1st Lion and Shield; 2 x 2nd; 2 x 78p English Pictorials. The A jewel, a tiara! 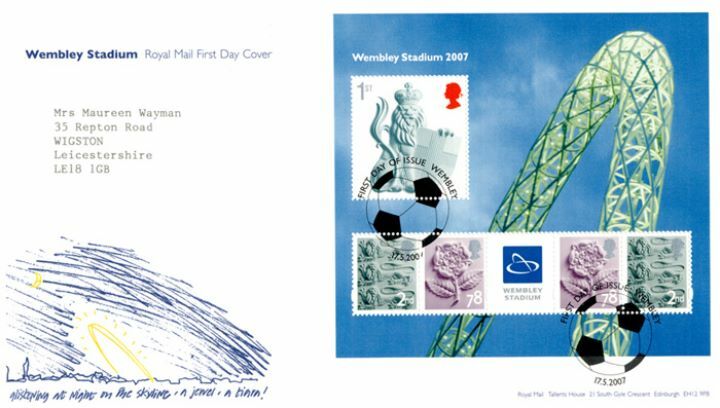 first day cover with the Wembley, First Day of Issue - Football, Special Handstamp postmark has been produced by Royal Mail/Post Office and features these stamps which can make a very collectible and lovely gift.